Enjoy rider comfort with the L014 Bar Stool in a 25", 30" or 36" seat height. 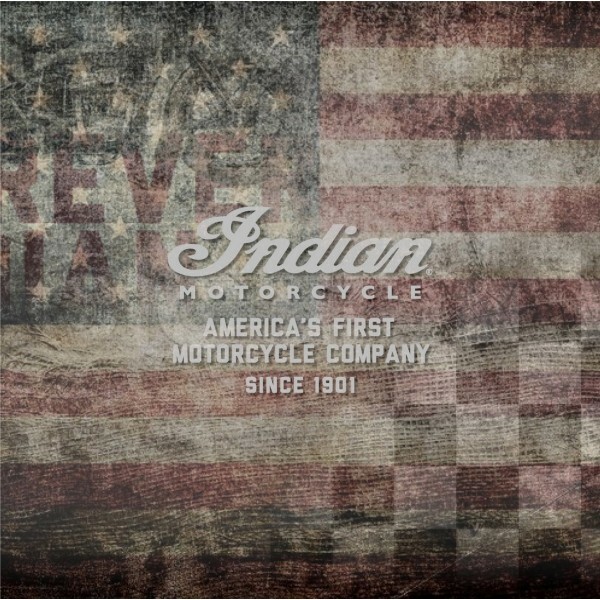 Show in a Black Wrinkle Ladder Style Back steel frame made exclusively by Holland Bar Stool Co.
Made for the ultimate Indian Motorcycle fan, show love for this American classic with this knockout from Holland Bar Stool. Holland Bar Stool uses a detailed screen print process that applies specially formulated epoxy-vinyl ink in numerous stages to produce a sharp, crisp, clear image of your desired logo. Logos are first surface screen printed on commercial grade vinyl, and are NOT made with a cheap, clear vinyl. You can't find a higher quality logo stool on the market. The plating grade steel used to build the frame is commercial quality, so it will withstand the abuse of the rowdiest of friends for years to come. The structure is powder-coated black wrinkle to ensure a rich, sleek, long lasting finish. Construction of this framework is built tough, utilizing solid welds. 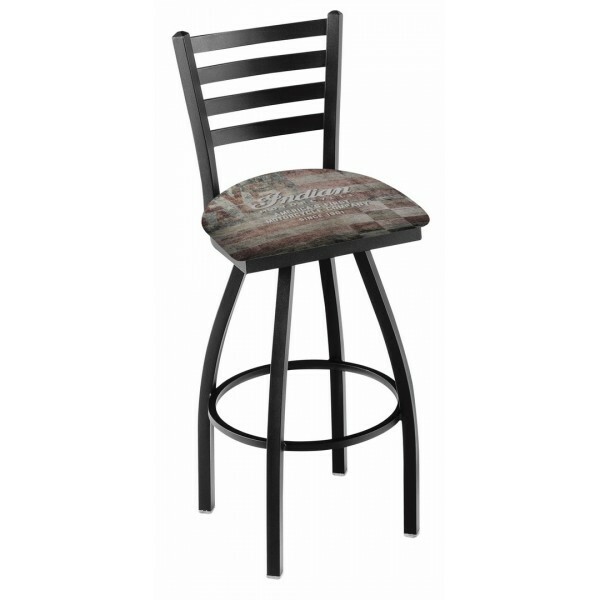 If you're going to finish your bar or game room, do it right, with a Holland Bar Stool. 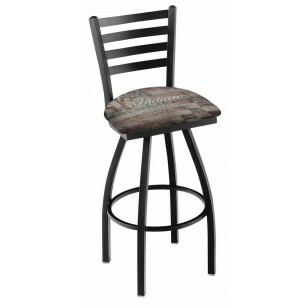 Holland Bar Stool stands by their products and will replace any defective product. It is the responsibility of the buyer to fully inspect product and call both the freight carrier and dealer within 24 hours of delivery to notify of any possible returns, due to defect or otherwise. Any non-defective returns made without a call within this 24-hour inspection window will be assessed a 20% restocking fee. For defective or damaged goods, the customer has 14 days to return the product, customer must call prior to returning product with reason for return. No returns will be accepted without a RMA # from our customer service department. Product must be like new and is subject to our inspection. DO NOT THROW AWAY ANY PACKAGING - product must be in new, original condition, packaged in original packaging and include all tags and paperwork that accompanied it. Product returns on non-defective merchandise must be shipped back with freight prepaid by customer, freight is non-refundable. 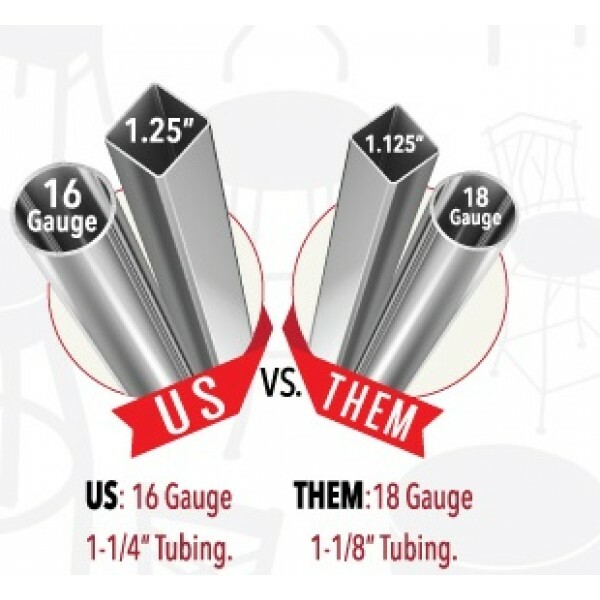 Shipping on defective product returns will be paid by Holland Bar Stool. If for some reason a customer is returning a non-defective product they have 10 days to contact the dealer to initiate a return. Again, if the 24-hour inspection call window has passed, all non-defective returns will be assessed a 20% restocking fee. All refunds are subject to inspection upon return. There is always a 20% Restocking fee for all custom orders.